Great news for everyone who's been patiently waiting for an unlocked iPhone 4S with no contract attached to it. From today the Apple US store will offer you spanking new, contract-free, factory unlocked iPhone 4S's. Prices aren't that bad either, starting at $649 for the 16GB version. 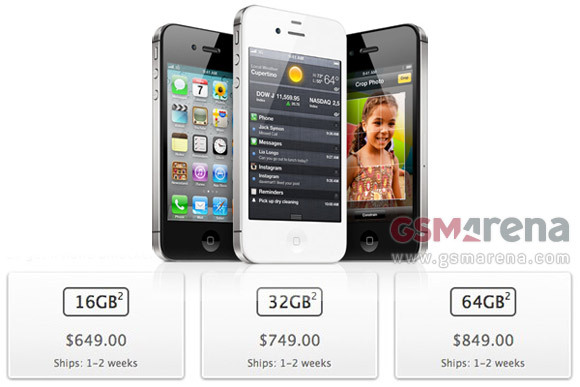 A 32GB iPhone 4S will cost $749, while the 64GB will sell for $849. Before you head up to the Apple store though check what Apple has to say about it. The unlocked iPhone works only on supported GSM networks, such as AT&T in the U.S. When you travel internationally, you can also use a micro-SIM card from a local GSM carrier. The unlocked iPhone will not work with CDMA carriers such as Verizon Wireless or Sprint. In related locksmith news, Sprint started SIM-locking all iPhone 4S handsets purchased from today, November 11 onwards. All devices bought and activated before today's date will remain unlocked, but how long will this last is still anyone's guess. Apple started selling unlocked phones since launch day.